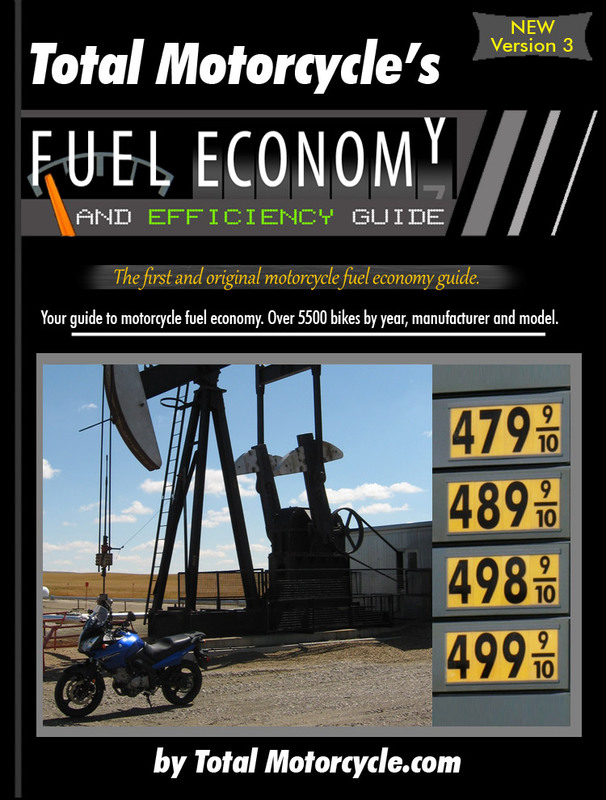 I am currently in the stages of making Version 4.0 of our (and the interenet's first ever) Motorcycle Fuel Efficiency Guide and I need your help. I am working hard to get fuel efficiency data from all the manufacturers, but it's hard because it's not required by law to report unlike car MPG/EPA is. Thankfully, they are working with Total Motorcycle on this. Last edited by totalmotorcycle on Thu Jun 28, 2007 9:52 pm, edited 15 times in total. Last edited by totalmotorcycle on Thu Sep 01, 2005 8:05 am, edited 8 times in total. Last edited by ZooTech on Fri Sep 02, 2005 10:39 pm, edited 3 times in total. Last edited by ronboskz650sr on Tue Sep 13, 2005 8:36 am, edited 1 time in total. comments: this is w/sidecar and in the city. anybody know what my bike should be making w/o the sidecar? Last edited by sidecarguy on Thu Sep 01, 2005 4:26 pm, edited 1 time in total. Everybike above this message has been entered into the TMW Motorcycle Fuel Guide. Thanks for your help and support. Feel free to go though your old motorcycle mags and pull some stats if you like. Note: Please us US MPG and US Gallons not Imperial. Error I noticed in the economy guide: you listed my bike as the Hyosung GV250 Comet. Not to be too picky, but the Comet is the GT250, it has the same engine, but weighs less, has 2 more horsepower, and is a sport/standard and not a cruiser. Although the gas mileage is probably almost the same, I can't be sure. DivideOverflow wrote: Error I noticed in the economy guide: you listed my bike as the Hyosung GV250 Comet. Not to be too picky, but the Comet is the GT250, it has the same engine, but weighs less, has 2 more horsepower, and is a sport/standard and not a cruiser. Although the gas mileage is probably almost the same, I can't be sure. Ops, sorry about that. I'll fix it tomorrow morning. Fuel Cap: 3.6 US gal. ...and I gave that man directions, even though I didn't know the way, 'cause that's the kinda guy I am this week! Obtained by tracking fuel usage for 20 tankfulls over 4 months (would have been closer to 30 fills, but I lost some data in a PDA power failure and spoiled some through simple idiocy). I've also noticed that fuel efficiency dropped quite a bit, from 60 or so to mid-50s, as I was improving my comfort level with speed. Going fast on motorcycles makes wind resistance the dominant power drain, causing mileage to drop. So if I had to guess city/highway numbers, they'd be something like 57/50.